India's most prosperous and economically advanced state has drawn up detailed plans to spend $16 billion over 5-6 years (by 2021) to upgrade its infrastructure including reviving shelved projects like a new Mumbai airport, a port and a vital coastal highway. With the active intervention of the central government, the state has lost no time in dusting off long-dormant projects especially in its capital Mumbai which will give a boost to infrastructure. Some of the projects were put off due to an obstructive bureaucracy, lack of private sector interest or in some cases, lengthy litigation. The road network consists of national highways (NHs), major state highways, state highways, major district roads, other district roads, village roads and internal city roads. Road Development Plan 2001-21 is being implemented in the state with a target to develop 3.37 lakh km roads. The total road length maintained by PWD and zilla parisahds (excluding internal road length maintained by local bodies) at the end of March 2014 was 2.64 lakh km. Out of this 2.64 lakh km of roads including national highways maintained by the state, the surfaced road length was 2.33 lakh km (88.5%). As on 31 March 2014 more than 99% villages were connected by all-weather roads. However, in all, 250 villages in the state did not have road connectivity. During 2013-14, an outlay of Rs 4,450 crore was approved for the road sector and an expenditure of Rs 3,108 crore was incurred. The primary objective of Pradhan Mantri Gram Sadak Yojana (PMGSY) is toprovide all-weather roads to the un-connected habitations in the rural areas with a population of 500 and above. A target of 24,439 km of road length for connecting 8,315 habitations in the state has been set under PMGSY. As against the target, 22,629 km of roads were created by connecting7,972 habitations up to 31 December 2014. The cumulative road length of 22,629 km was constructed and 7,972 number of habitations connected (up to December 2014) under PMGSY since inception in Maharashtra. Maharashtra State Road Development Corporation (MSRDC) has completed 20projects incurring an expenditure of Rs 7,018 crore up to December 2014. The total toll collected from the partially and fully completed projects up to December 2014 was Rs 6,672 crore as against the total expenditure of Rs 8,566 crore. On an average, Maharashtra State Road Transport Corporation (MSRTC) carried 70.22 lakh passengers per day during 2013-14. Effective kms operated per day has increased by about 2.7% and the percentage load factor has decreased by 2.2% points over the previousyear. The public transport is the major mode of transport in cities. This facility is available in 23 cities in the state. While MSRTC provides local transport facility in seven cities(Aurangabad, Nanded, Nashik, Sangli-Miraj, Ratnagiri, Chandrapur and Vasai-Virar-Nalasopara), the BEST services ply in Mumbai Metro catering to vast segments of population. 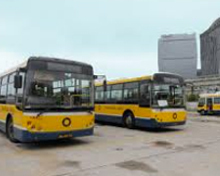 In Pune and Pimpri-Chinchwad Municipal Corporation area the PMPML operate government buses and in remaining 13 cities their respective local bodies are providing such facilities. Hired forms of transport include metered taxis and auto rickshaws, which ply specific routes in cities. Other district roads and village roads provide rural people accessibility to meet their social needs as well as the means to transport agricultural produce from villages to nearby markets. Major district roads provide a secondary function of linking between main roads and rural roads. 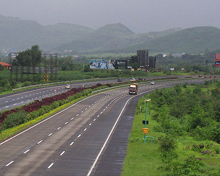 Almost 99% of villages are connected via the highways and modern roads in Maharashtra. Average speed on state highways varies between 50-60 kmph due to heavy presence of vehicles. In villages and towns in Maharashtra, the vehicle speeds are as low as 25-30 kmph. The railway route length in the state as on 31 March 2014 was 6,103 km (including 378 km of Konkan railway) which is 9.3% of the total railway route length of 65,808 km in the country. The first train in India ran between Mumbai and Thane on 16 April 1853. It was not only India's but also the Asian continent's first train. Rail transportation consists of the Central and the Western Railway zones that are headquartered in Mumbai at Chhatrapati Shivaji Terminus (CST) and Churchgate respectively. The Mumbai Rajdhani Express, the fastest train in India, connects national capital New Delhi to Mumbai. CST is the busiest railway station in India serving as a terminal for both long-distance trains and commuter trains of the Mumbai Suburban Railway. Nanded division of South Central Railway comprises Marathwada region. 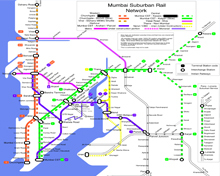 Suburban rail network is the principal mode of mass transport in Mumbai. Two zonal railways, viz. Western Railway (36 stations) and Central Railway (62 stations) operate Mumbai suburban train services. The Harbour line (38 stations) is part of the Central Railway. A fleet of 205 local trains (rakes) are utilised to run 2,813 train services, carrying 80 lakh passengers per day. Five metro rail corridors have been finalised for development in phases by CIDCO (City and Industrial Development Corporation of Maharashtra) for the ambitious Navi Mumbai Metro Rail. Belapur-Pendhar-Kalamboli-Khandeshwar-Navi Mumbai International Airport (NMIA) corridor shall be executed in the first phase in three stages. 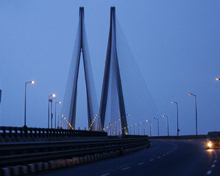 The work in the first stage, Belapur-Pendhar (11.1 km) is in progress with estimated project cost of Rs 2,997 crore. An expenditure of Rs 497.3 crore has been incurred upto December 2014. Belapur-Pendhar (first stage) is expected to be completed by 2017. The state has 720 km long coastline with two major ports operated by Mumbai Port Trust (MbPT) and Jawaharlal Nehru Port Trust (JNPT). During 2014-15 up to December, MbPT and JNPT handled 461.66 lakh MT and 480.73 lakh MT cargo traffic respectively. The operating surplus for MbPT in 2013-14 was Rs 339.06 crore which was 62% more than the previous year. The operating surplus for JNPT in 2013-14 was Rs 667.52 crore which was 36.5% more than the previous year. 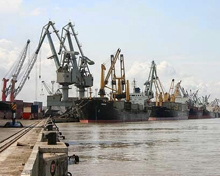 Both these two major ports are directly controlled and maintained by the central government. There are around 48 minor ports in Maharashtra. Most of these handle passenger traffic and have a limited capacity to handle cargoes. The non-major ports together handled 148.96 lakh MT cargo traffic and96.43 lakh passenger traffic during 2014-15 up to October. None of the major rivers in Maharashtra are navigable and so river transport does not exist in the state. There are three international and seven domestic airports in the state. AAI along with the Mumbai International Airport Ltd has undertaken a mega project to build a new integrated terminal T2 for modernisation of Chhatrapati Shivaji International Airport (CSIA), Mumbai. The new terminal T2 is a state-of-the-art facility with a capacity to handle 40 million passengers per annum. The project cost is Rs 12,500 crore, out of which expenditure incurred up to 31 December 2014 was Rs 11,401 crore. To reduce congestion in Mumbai International Airport, an additional airport has been proposed in four phases through PPP at Navi Mumbai with estimated cost of about Rs 14,574 crore. Project cost for phase-I is about Rs 6,147 crore (including pre-development cost). It is expected to be commissioned by 2019 with an initial capacity of ten million passengers per annum. The Multimodal International Passenger and Cargo Hub Airport at Nagpur (MIHAN) project comprises developing existing airport as an international passenger and cargo hub airport. This is being implemented through MIHAN India Ltd (MIL), a joint venture company comprising of Maharashtra Airport Development Company Limited (MADC) and AAI. Five airports -- Nanded, Latur, Osmanabad, Yavatmal and Baramati -- were awarded to Reliance Airports Developers Private Limited (RADPL) by MIDC to develop, upgrade, operate, manage and maintain for 95 years of lease in November 2009. Only non-scheduled flights operate from these airports. The installed capacity has increased by 20% during 2013-14, whereas the Central sector allocation to the state increased by 1.6% over the previous year. The total installed capacity as on 31 March 2014 in the state comprises public sector 38.1%, private sector 54.5%, and PPP (Ratnagiri GasPower Project Ltd-RGPPL) 7.4%. Total electricity generated (including renewable sources) in the state was 91,987 million units (MUs) in 2013-14 which was 4.4% higher than the previous year. During 2013-14, the state has received 39,900 MUs electricity from the Central sector. During 2014-15 up to December, the total electricity generated in the state was 78,488 MUs, 18.1% higher than that for the corresponding period of 2013-14. 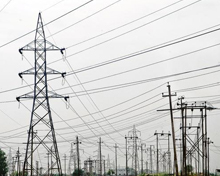 During 2014-15 up to December, the state has received 32,170 MUs electricity from the Central sector. Maharashtra ranks top in mobile connectivity and tele-density in India as its villages have reaped the rewards of digital makeover. Apart from a variety of cell phones that have invaded the remote places, computer usage has been common in rural Maharashtra as farmers make optimum use of internet to equip themselves with the latest in their trade. The total number of landline connections at the end of September 2014 in the state was 52.63 lakh. The landline and cell phone connections per lakh population were4,390 and 87,810 respectively. The internet subscriber base in the state as on 30 September 2014 was 3.72 crore which is highest among all states.